This entry was posted on January 31, 2019, 12:25 and is filed under Knitting Projects. You can follow any responses to this entry through RSS 2.0. You can skip to the end and leave a response. Pinging is currently not allowed. OMG–dog ears!! I say you MUST go for that! The hat is very, very cute–will it fit a 10-pound baby?! Probably not for long – but she can pass it on to her sister afterwards who has a baby due in June. Although, of course, I shall probably make another one for her in different colours anyway. it was like déjà-vu this morning! There was I, browsing through my WP reader when I saw Wild Daffodil’s pixie hat . . . and there you’ve been knitting one up! It looks lovely, especially with the purple & lilac. A very practical & pretty gift for a winter baby. It’s a small blogging world isn’t it? Wow-wow-wowzers! That was quick! And doesn’t it look stylish in the colours you have chosen! It is thrilling t see your version. Thank you SO much for sharing and for being the first ‘tester’ – fabulous! I do hope it fits – there is a fair bit of stretch in the pattern. I’m glad you like it and thank YOU so much for generously making this cute pattern available. I think you should add ears to the hat for the baby, rather than worry about making hats for the dogs! It’s a gorgeous little pixie cap, like an upside down acorn cap, and a pair of tiny pointy ears would be too cute! It would be cute in acorn colours wouldn’t it? What all autumn babies should be wearing. And to answer your question: No, not silly at all! We doggie people view the world in a different and special way. Holes for dog ears would be fun! Would dogs keep it on though? Some dogs would keep it on – I’m not totally sure about my two though. Sandra has devised a good pattern – and so quick to make too. Yes, I think my family are all too diverse now – both mentally and physically. Still, I’ll keep trying. Congrats to all on the new arrival. And yes, I think you need to go for the holes for dog ears! It would make for some amusing ‘goings on’ and even more amusing photos – I think it would be worth a try. Congratulations to all for the safe arrival of Baby Benjamin. The hat is bang on trend and I have it on excellent authority that the modern pixie is sporting grey in 2019. As for a dog version, yes, all the Twilight dogs need one. Now that would make a great photo wouldn’t it? A new baby is a joy. I’m always incredibly pleased my kids are adopted when I hear tales of weighty newborns. I’m sure he’ll love his hat. As would your canine friends! I know! Mine were quite small, thankfully. Congratulations to the whole clan on the new addition. 🙂 Babies bring a special light into the world. Your version of the pixie hat actually looks quite elegant. It’s perfect for a boy. Thank you. I hope my niece will like it – and it fits him!! Dog-ears, dog-ears, dog ears!! What a clever girl you are! 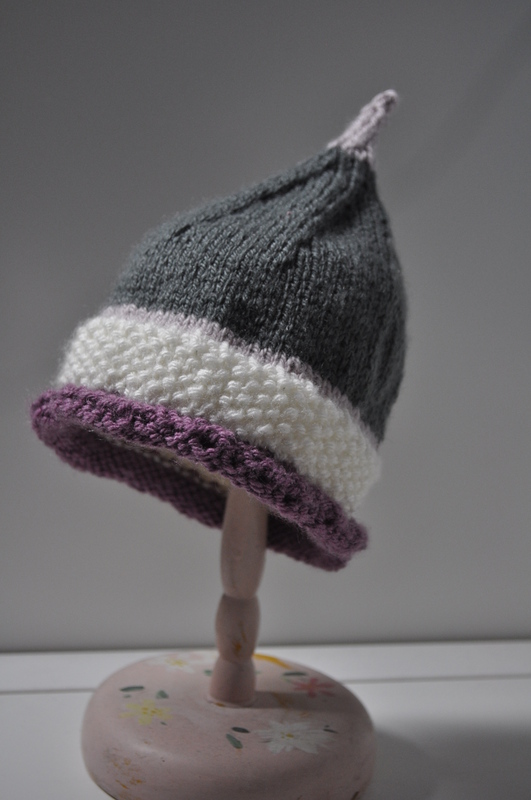 I so wanted to have a reason to knit the pixie hat ………. I look forward to seeing one on you know who. You might need to add a drawstring tie to go under a doggie chin, to keep it on, but holes for ears, definitely.! And it’s gorgeous as it is, Benjamin will be a very stylish baby…..10 lbs is big, I had an 8 lb-er and that was quite big enough. I’ll check out the pattern, I’m always looking for cute, quick knits for charity knitting. This would probably fit the bill perfectly. Congrats! To the nephew and the hat! Damp cold, yes he’ll still need a hat, won’t he! Congratulations on the new addition to the (extended) family! You’ve done the little hat perfectly. I agree with Magpie that these are great colours to suit a (winter) newborn. What a nice thing to do for your mum. It’s proving an uphill struggle. It doesn’t help that most of us are not living in the same vicinity – or, even the same country. Still, I’m trying. Thank you – it’s on its way over to the U.K. now, just hoping it’ll fit him. I’d love to know if it does fit him. I have asked for photographic evidence!! Mr. Tialys has gone over to the U.K. today and will be posting it to her so we should soon know. I think it would be the keeping it on that would be the problem. Some dogs will and some dogs won’t, a bit like kids really. One of my daughters was always in a hat when a baby and toddler the other wouldn’t countenance the idea at all.